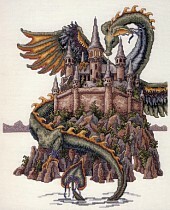 A colorful winged dragon encircles a medieval island fortress. Since dragons are intensely curious by nature, its attention is drawn to the lighted windows of the tall central tower. Who actually lives in that lonely isolated castle? An exiled king? An imprisoned maiden? Or maybe a wizard?